@robo: I see your point now. Multi-lane roads bring more problems than solutions. I do understand Locomotion's overtaking problem, which is why I rarely use trucks. My point is pretty simple: There are diagonal things (roads, rails, ect.) in P1SIM, and I'm trying to help make them look good. What if the player wanted diagonal track next to diagonal roads? It all needs to fit together. After looking at my posted pictures again, It looks like I want roads with ten or twenty lanes each, this is not true. I'm just thinking of the programming and the geometry. If the player does something ridiculous, the game can't crash. Sorry if my above posts were unclear. Here is another possible solution to 45 degree roads looking to thin or fat. Double the size of the road. I checked your image and played around with the necessary adjustments in GIMP. Although I really like your idea due to the fact that the diagonal roads wouldn't look too thin (like in the current version of P1SIM), I will not implement this concept at the moment. There would be major changes in the source code as well as in the usability. But the concept is nice. And it looks like a promising future feature. Does the game really need multi-lane roads? There will be multi-lane roads, since this is a very important feature of P1SIM. The multi-lane roads/rails allow very complex networks. I have been thinking about my idea of roads that are 2 grid squares wide. The next natural progression of this ideas is adding one additional lane to a road (one square wide) to help with higher traffic areas or splitting the road into two one lane roads. This brings us back to the original problem of roads looking weird at 45 degree angles. There would be major changes in the source code as well as in the usability. Smallfly, throw my idea out, it doesn't solve anything. I would much rather have a game that looks a little funny, than a game that restricts the player from features common in real life. Just scale down your first idea by factor 0.5 and restart thinking. Just focus on the diagonal roads. The straight roads will be one tile wide. I dont get the point. What's your pain here? Why do you insist of making the roads stick to each other? There is no point in that - if you want 4 lane roads - you have to build a 4 lane road, not 2 one way roads that stick to each other. Without the pain you can make roads that's thickness is equal in every direction and make some joining pieces where one way roads join with two way roads join. If I was to say: look at Simcity 4. This really the best piece of work out there related to the topic (and not only this). The things are straightforward there - you got an avenue, good , you can join it with normal roads. Two one way roads dont fit into an avenue. And the result is mind blowing if you take a close look. Simcity is great. But it follows another concept. The game doesn't bother the player with road details. You just place a small/medium/large road. They connect. Thats it. P1SIM wants to offer more detailed options when it comes to infrastructure design. If you take a closer look you will see the same pattern in your game. Simcity 4, when used with mods gives an enermous amount of flexibility. Sim City 4 has the same problem as we are discussing here; the roads look to thin or thick ( I don't remember which ) when traveling at 45 degrees, whether or not they have multiple lanes. Why do you insist of making the roads stick to each other? The point is you want roads to be equally functional at 90 degrees and 45 degrees. The lanes have to "stick" to each other, or not have gaps between them, if you want to build an intersection or add any of Smallfly's amazing modules on or around the roads, at 45 degrees. The road thickness is not equal in every direction. Did you see my pictures where the roads are 1 unit thick at 90 degrees and 0.7units or 1.4 units thick at 45 degrees. The roads have to fit in the grid somehow. I'll keep thinking and keep you posted. No, Simcity 4 has not any problem with roads/rails and other tracks being too thin or too thick at any angle. This is because the game was made to provide multiline tracks separately. Also the roads would remain perfectly functional if it was done that way. Again I'll refer to SC4, where mods enable for custom modules, take a look at RushHour and mods people created for this game. There is nothing preventing for integrating this with existing module system. And personally - I was thinking of the topic before, and I realised that I've reinvented the wheel that people at Maxis invented first. Really - SimCity is the state of the art when it comes to tile based construction of tracks. I think I see your point. 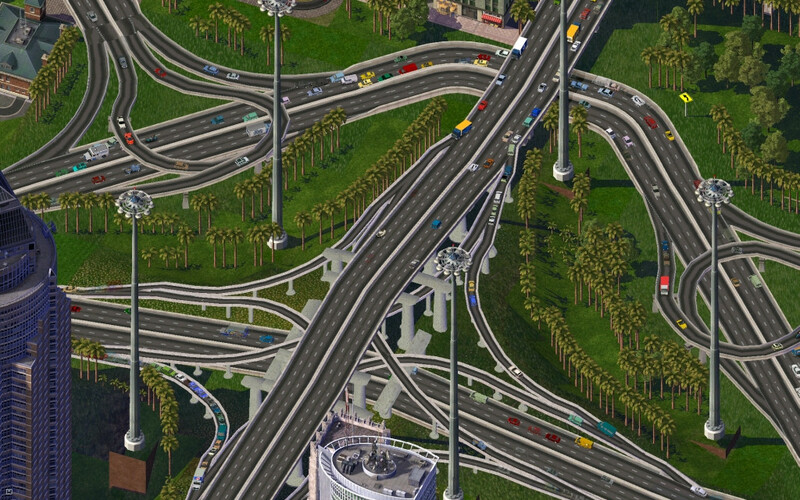 Sim City 4 allows the entire highway / road / street to be built at 45 degrees and look good (not too thick or thin). But I also notice that there is nothing parallel to that highway AND directly adjacent to it, just some open grass area and trees. So, how is that highway using grid space? Is there wasted grid space on either side of the highway? If two 45 degree highways / roads / streets were built next to each other, would there be a gap between them? This also means the player can't just add an additional lane to a road, they would have to delete the road, and replace it with a highway (or build over it, but this is the same idea, the computer deletes the old road). Really - SimCity is the state of the art when it comes to tile based construction of tracks. Building Highways or bridges over roads could be a pain in Simcity 4 and I don't really like the idea of completely prebuild intersections because it's limited and a bit boring, but I like the use of single-lane one-way-roads on the screenshot to enter or leave a highway. RCT2 had an interesting concept to automatically add road markings for streets (unfortunately you could build them only in the editor and they were non-functional) but the idea to build a road with two independent directions (like a railway) offers more freedom than the usual way to build roads that you see in games. There will always be some unused grid space, that's almost impossible to utilize every grid. And yes player have to rebuild roads but if the algorithm is inteligent enough to figure out that the road that was build adjacent is meant to be another lane - it can be done automatically. But actually I've never seen this before. Building highways over roads in SC4 is very easy, about bridges over roads - that is impossilbe in SC4 due to a limitation (at least I haven't seen anywhere that it was done). As I said before - the algorithm can be inteligent so it can replace the modular elements automatically. For example you could place an avenue over a single road tile, and the replacement would occur in place. There will always be some unused grid space, that's almost impossible to utilize every grid. Yeah, but hopefully the unused spaces are minimal (see screenshot). But the current layout won't be final. At least I will implement larger transitions between hori/verti and diagonal roads. The current very hard transitions look strange. I've noticed in Sim City 4, the roads are the same width at all angles. At 45 and 90 degrees the roads are 0.7 grid spaces wide. This mean there is no wasted space at 45 degrees, but 0.3 grid spaces wasted at 90 degrees. At 90 degrees, the wasted space is filled with sidewalks and scenery. looks nice so what about transitions from small road to big road example 2 lanes to 4 lanes? I think you should try the larger transitions. It will look much better, I imagine. And then again - for most of what your screenshot shows, a curved road will be sufficient. The only time one ever really needs a diagonal road is to actually connect two places with the shortest possible route. So my advice would be: Don't worry too much about this, it will work out in the end. Alright, here's another idea of mine. I'm going to figure this out one day! For a single road (2 lanes, one grid space wide), it's 1.4 grid spaces wide at 45 degrees, but the road only visibly occupies 1.0 grid spaces, the 0.4 is scenery or invisible. For 45 degree roads with 4, 6, 8, etc. lanes, they alternate in width, from 1.4 to 0.7 wide but the program "equalizes" the visual width by moving the center line to the ... center. The two parallel roads use different grid space, but visually look equal. Every two roads (4 lanes) gets a visual overlay to hide the alternating. This idea allows one grid space to have two lanes (like the current version of P1SIM), so it will work with smallfly's modules at 90 degrees. I think the solution in 3.jpg looks good. Smallfly could still try to reproduce the interface for railroads of locomotion (which may be difficult, too), but it may be quite good for roadbuilding and building bridges, although not perfect. Of course it's more laborious than the usual drag and drop to build roads (maybe too much for the average gamer? ), but you can build the most basic intersections. On the first screenshot you see a "simple crossroad". Instead of prebuilding the intersections for the player, you could provide an overlay which you can turn on or off to show the path for vehicles. So: Best idea so far! Edit: Yap, definitely looks cool - look at the picture I created using inkscape. Only downside: An odd number of lanes will have a gap when going diagonally. That seems bearable.